This table is a reference guide for students learning about food/cooking/baking/the kitchen. 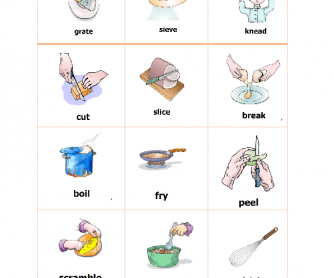 The table contains common cooking verbs with images for easy understanding. I usually print the table and put copies out on the table(s) for students to refer to during related activities further in that lesson. The table can also be used as a flashcard set to drill cooking verbs.